3rd Place at State Tournament! 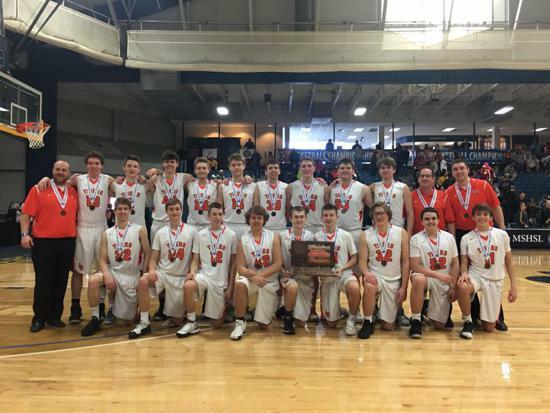 The 2018-19 Lake City Tiger Boys Basketball team finished the season defeating Perham 51-47 to capture the 3rd Place Trophy at the State Tournament this year. The Tigers finished the season with a 28-3 record and the most wins in school history! The theme of our off-season program is "No Deposit, No Return!" Players in the Lake City Basketball Program can click on the links below to access 300 Hour or 150 Hour Club forms. Also, Hoop It Up Summer camp dates are as follows: June 10-14 and July 15-19. Signup will occur in May. 2017 300 Hour Club Winners! We would like to recognize Lake City Basketball players who made a commitment this off-season with the Lake City Basketball 300 Hour Club Program. The theme of the Lake City 300 Hour Club is “No Deposit, No Return”. Players documented their hours for the following basketball related activities: Off-season basketball work, basketball camps, making the honor roll, weight room, participating in fall/spring sports, individual workouts, speed/agility camp, service work, free throws, and summer leagues and games. Players kept a daily calendar of these activities and are rewarded with 300 hour club shirts.